Instagram empowers brands to distribute compelling media in a way that tells a story and engages consumers. For consumers, Instagram enables them to tag their location, join a communal conversation through hashtags and visually share their daily activities and interests. Because of its highly visual nature, many brands view Instagram as an extension of their print or display advertising efforts. This is a major missed opportunity. Instagram is more than just a broadcast channel. A strong Instagram engagement strategy that prioritizes authentic, one-on-one conversations will impact a brand’s bottom line. Don’t believe us? Our data report revealed that 75% of consumers have purchased a product because they saw it on social media. Even more telling were the 70% of consumers who cited that they were more likely to buy a brand’s product or services when that company responded or interacted with them on social. Sprout supplies businesses with Instagram management tools to foster and grow those relationships. Today we’re excited to launch a product feature that makes it easier for brands to prioritize Instagram engagement and deliver a more personalized customer experience. The Instagram Contact View displays a contact’s profile details and surfaces hashtag, geolocation and comment history. Information your team can use to provide context to your community and keep engagement top-of-mind. Within the message stream, click on an Instagram user’s avatar. Click on an Instagram user’s name at the bottom left corner of any inbound message bubble. Click reply on any Instagram comment. Context is key to understanding and nurturing the customer relationship. Whether it’s a first time customer who has a question about your brand or a long time follower who regularly engages, the Instagram Contact View streamlines internal communication and equips your team to respond knowledgeably and accurately. The new Instagram Profile Card displays contact details such as name, bio, website and number of followers so that your team can understand the person behind the comments. The Description field is a readily accessible place where your team can add pertinent memos about a contact. This tool is particularly beneficial for documenting influencer and advocate overviews. In addition to the Description field, Notes—located on the top right hand corner of the Profile Card, lets your team annotate interactions with a specific contact. Notes appear chronologically within a contact’s message history. This tool is especially beneficial for customer support agents who are resolving issues or social media managers nurturing prospective leads. 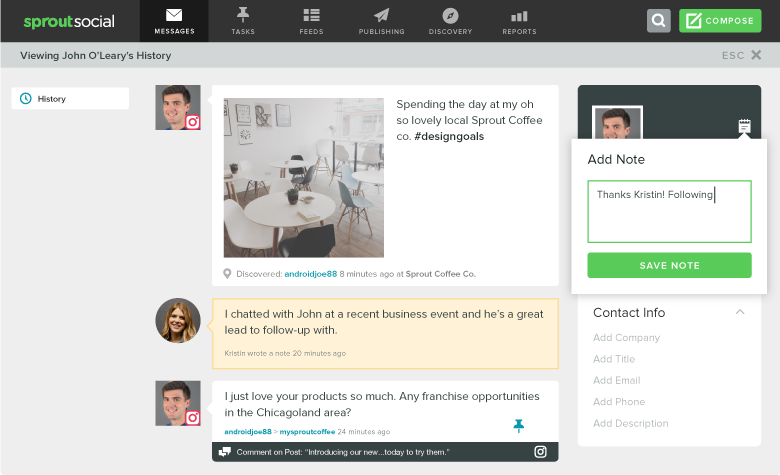 The History tab surfaces all of the comments left by a contact on any of your brand’s posts. If a follower comments regularly, referencing past comments helps your team create an exceptional brand experience with every response. Brand Keywords that are monitored in the Smart Inbox also appear within History. Armed with this historical context your team can better identify potential new leads and influencers and engage more personally. When responding to users on social media, context is everything. Knowing if a customer has engaged with you in the past helps to better nurture and maintain strong relationships with loyal brand advocates. 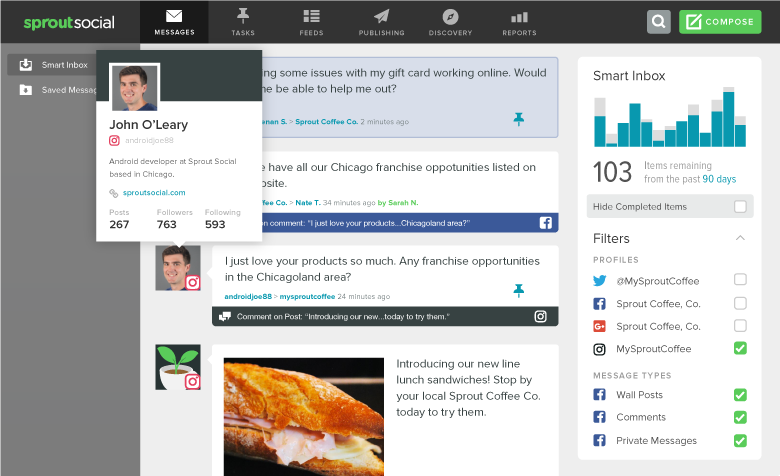 Sprout’s social CRM provides both contextual information and collaborative features so your team can efficiently manage incoming Instagram comments and better manage relationships. 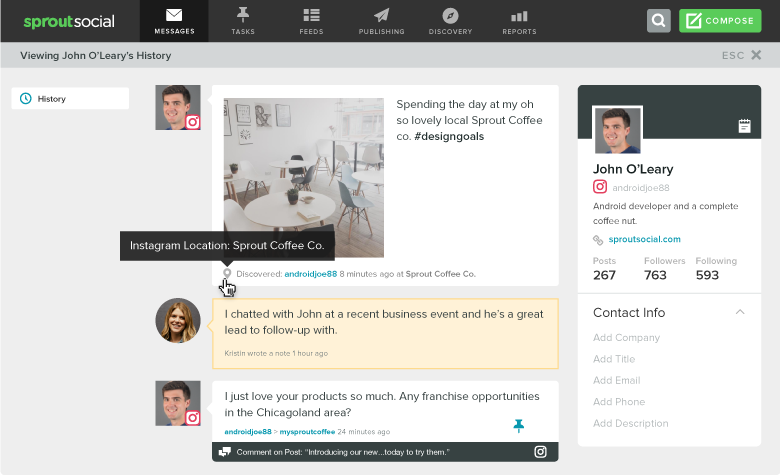 Stay tuned for more updates to the Contact Views within Sprout!